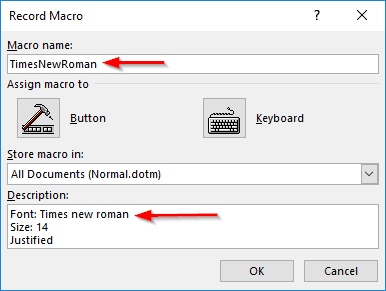 » How to insert macros into Microsoft Word 2016 and 2019 documents? Applicability: Word 365, 2019, 2016; Windows and MAC OS X operating systems. I am a teacher and I am using Word 2019 to write important documents. I repeatedly need to change the font and size for the paragraphs. Is there a way to change them to my preferred font on one click? To set same font of same size with justified text we can use Macro in Microsoft Word 2016. We will discuss how to record macro and set them on one click in Word. Make sure that your developer menu is visible in the ribbon. In the Code panel, we’ll see the Macros and Record macro buttons. Set the name for the macro and add description for the macro. Executing the macro can be done in three ways. They can be assigned using button, keyboard and also we can execute them manually. Click on the Button icon to add a button to Word’s Quick Access Toolbar. Now, select the macro you just created and click Add to add the button to the Quick Access Toolbar. Click on the Modify icon to select new icon and to rename and click OK.
Now your Macro will start recording, so now it’s time to work on your text and formatting. After finishing working on the template, click Stop recording. If needed we can even click pause recording and resume recording to work later. Click on the keyboard icon to add a shortcut for the template. In the Press new shortcut key, press and hold the Ctrl/Alt key and press any of the letter keys to assign it to display the template. Click Assign and select Close. Now your Macro will start recording, so it’s time to work on your text and formatting. Now, whenever we press the assigned key in the word document, your macro will be executed and the template will be added. After the recording is finished, click the Developer tab and select Macros in the code option. Here we can find the macros that we have created so far. Now, click on the macro that has to be executed and select Run. Thus a macro can be executed manually. If you are an expert in Visual Basic for Applications we can edit the macros and write programs to automate various kinds of works using VBA. Aside Note: FYI – some of the Microsoft Office applications, such as Powerpoint and Outlook, do not have built in macro recorders. Therefore, writing VBA is mandatory for writing Powerpoint macros and automating Outlook. To edit a macro, click on the Developer tab and select Macros in the code option. Click on the macro and select Edit. Let us put our own advice into action. Coming back to our reader’s question. We’ll create a macro to help us automatically format a paragraph font to Times New Roman, size 14 and justified alignment. Enter the name, description and selected Button in the Assign to macros. Modify the Macro Name and icon. Now, selected the texts and changed the font to Times New Roman, size to 14 and clicked Justify. You’ll see your assigned Macro icon in the Quick Access toolbar. So whenever the text is selected and your macro button is clicked, it will be changed to our preferred font & size.